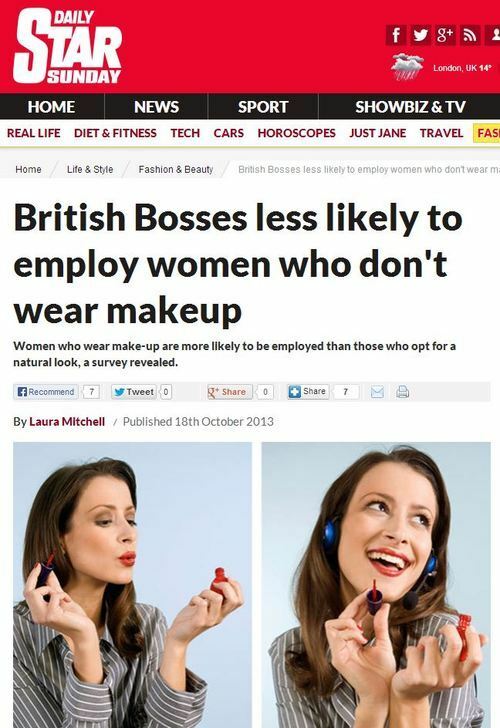 Women who wear make-up are more likely to be employed than those who opt for a natural look, a survey revealed. 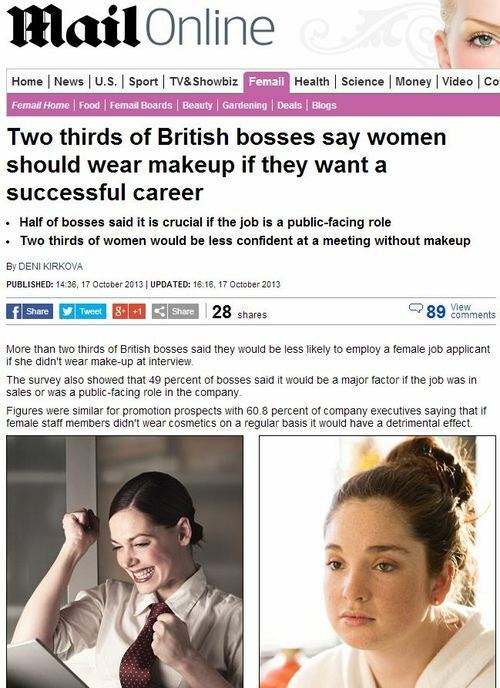 MORE than two thirds of British Bosses said they would be less likely to employ a female job applicant if she didn’t wear make-up at interview. The survey also showed that 49 percent of bosses said it would be a major factor if the job was in sales or was a public-facing role in the company. Figures were similar for promotion prospects with 60.8 percent of company executives saying that if female staff members didn’t wear cosmetics on a regular basis it would have a detrimental effect. Emma Leslie, beauty editor at escentual.com, who conducted the research, said: ‘Whether rightly or wrongly, British bosses clearly think that keeping up appearances at work is an important factor for female staff if they want to get on in their career. ‘It’s also quite startling to learn that women feel that they need make-up in order to impress at work, and our survey showed there is a strong psychological element to wearing make-up that makes women feel more poised, confident and ‘put together’. 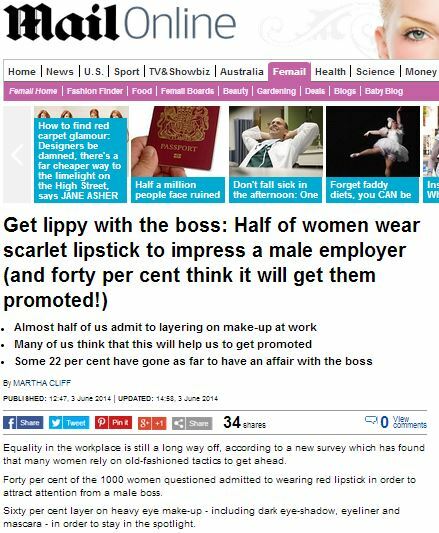 No surprises to discover, then, that the company telling women they need to wear make-up to be taken seriously are a company who sell make-up. This entry was posted in Escentual and tagged daily mail, daily star, deni kirkova, emma leslie, escentual, laura mitchell on October 28, 2013 by Michael Marshall. A make-up bag can be among a woman’s most precious belongings. So perhaps it is no surprise that the average value of its contents is a rather expensive £172. 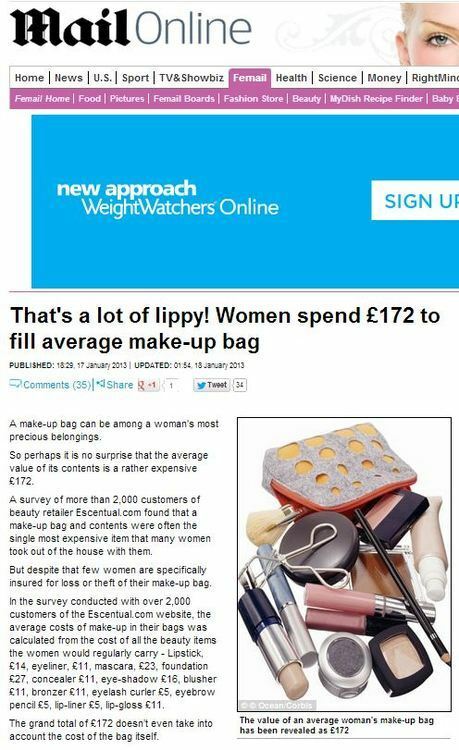 A survey of more than 2,000 customers of beauty retailer Escentual.com found that a make-up bag and contents were often the single most expensive item that many women took out of the house with them. Who were the company who figured out that women spend a lot of money on make-up? 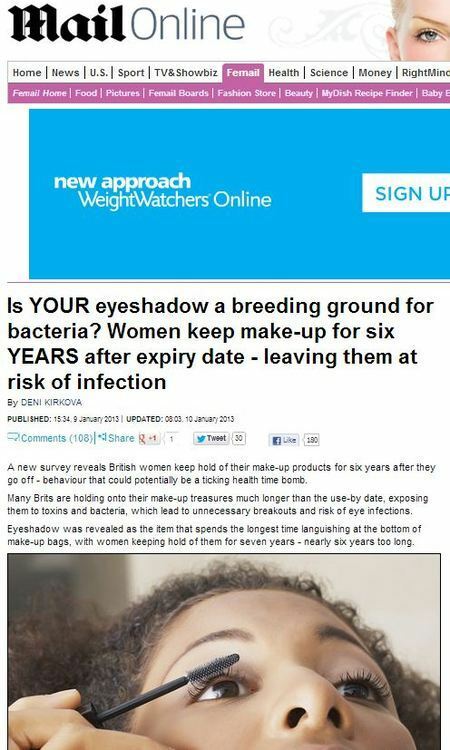 That would be make-up retailer Ecsentual, who make money from women spending a lot on make-up. A new survey reveals British women keep hold of their make-up products for six years after they go off – behaviour that could potentially be a ticking health time bomb. Many Brits are holding onto their make-up treasures much longer than the use-by date, exposing them to toxins and bacteria, which lead to unnecessary breakouts and risk of eye infections. Eyeshadow was revealed as the item that spends the longest time languishing at the bottom of make-up bags, with women keeping hold of them for seven years – nearly six years too long. The real tragedy to Ecsentual’s research is that it comes just too late for the poor hapless male, who may have been tempted to venture into the make-up market just weeks before these remarkable findings came out, in buying their partners gifts for Christmas. 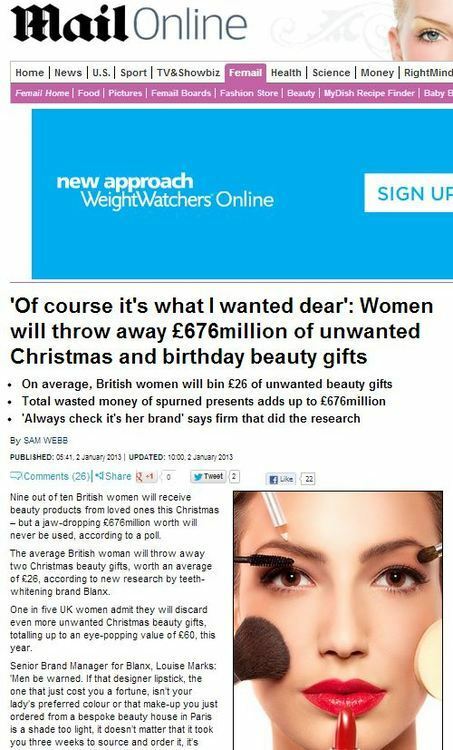 Nine out of ten British women will receive beauty products from loved ones this Christmas – but a jaw-dropping £676million worth will never be used, according to a poll. The average British woman will throw away two Christmas beauty gifts, worth an average of £26, according to new research by teeth-whitening brand Blanx. If only British men had the advice of cosmetics firm Blanx before Christmas, just imagine how many comsetic products could have been spared the January bins! Think of the lipsticks, oh God won’t someone please think of the lipsticks! This entry was posted in Blanx, Christmas, Escentual and tagged blanx, christmas, daily mail, deni kirkova, Ecsentual, louise marks, sam webb on January 21, 2013 by Michael Marshall.